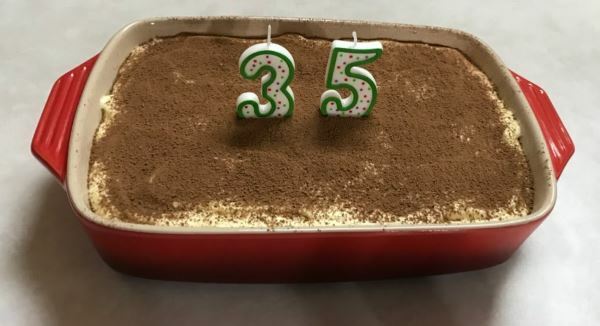 Gwen's favorite cake for her 35th birthday. 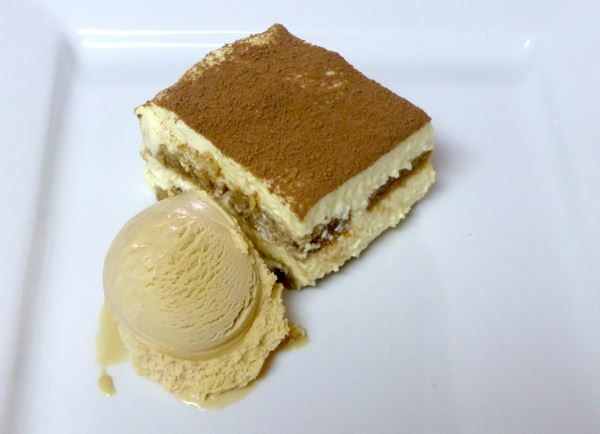 Serve alongside some honey-ginger ice cream for a perfect dessert. Combine the egg yolks and sugar in a double boiler. Whisk constantly over boiling water for 10 minutes. Remove from the heat and whip the egg yolks until thick and light-yellow colored. Add the mascarpone, whisking until fully combined. In another bowl, whip the cream to stiff peaks. In another bowl, combine the coffee and Kahlua. One lady finger at-a-time, dip into the coffee mixture (1-2 seconds) and then place in a 9"x13" casserole dish. Continue, arranging into a full layer covering the bottom as shown in the picture. Spoon a layer of the mascarpone mixture on top. Repeat step 6, building another layer of lady fingers. Spoon another layer of mascarpone mixture on top. Repeat steps 6-9, this time in a smaller 7"x9" casserole dish. Immediately before serving, dusk with cocoa powder.